Princess, your two words DO convey the larger picture. 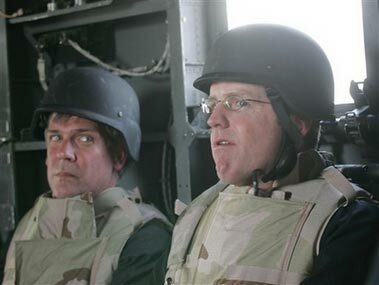 Had El Presidente announced his surprise invasion of Iraq today, they'd've had more reason to look more scared and less like Laurel and Hardy. I can't believe that pic. I would swear it's from some B comedy, but it's fer reals. Great Picture Your Highness!!!! and yes, your two words say volumes..one and only time these pasty white balls of lard will ever be in a military zone..
Notice Bartlett's attempt at a belligerent snarl. Great pic! They both look as if they are scared sh*tless. I wonder why? I would have thought that the recent "great victory" in the "war against terror" might have inspired a little confidence. Maybe now they might have a little more insight into what it feels like to be one of the troops on the ground, so blithely sent there by these armchair warriors. lol @ 6 minutes..thats all that they could stand..too afraid and too scared that someone would want to harm them..
i can't stop laughing at this picture. at first i thought this was from some sort of awful hogan's heros remake. i think tony snow is about to piss himself. looks like danny already has. I understand the sarcasm here, and I definitely chuckled at the photo. However, I have actually been in this position, and I can assure you it is more than a little unsettling. I remember one particular flight over Balad during Ramedan in a Chinook, we had to bank and weave hard when making the approach over the city. I think we were taking random small arms fire from the ground. But it was 2AM and the noise in one of those things is deafening, so I can't be sure. I like to think of myself as a fairly manly-macho-Lee-Marvin kind of guy, but I was scared shitless. So I'm just saying, give these guys a break. I understand you don't like 'em. They're not exactly my favorite people in the world. But they had very good reason to be nervous. It is funny though. They do come off as total pussies in the photo. Snow looks like he's wondering if Bartlett's about to hurl. Helicopters can do that to ya. Tony Snow: Dan, Is this really how liberators arrive into a liberated country? WTF do we think we're doing? Dan Bartlett: I like to think of it this way Tony- We've got to get those poll numbers up. Why didn't they just do a simulated visit to Iraq? Just intercut a bunch of footage, put thses guys in costume in a video game parlor ride, and hey, no one realy would have had to put their balls on the line. It would have accomplished as much as the real visit, and saved money. These guys are part of the whole bloody crew who created this mess. They don't deserve any breaks. is it me or are American helmets starting to look a lot like Nazi helmets? It's not just the helmets, its the grey digital uniforms and that V we paint on our vehicals.